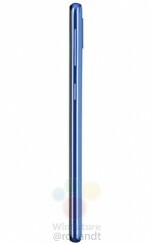 Samsung introduced the Galaxy A50 and Galaxy A30 at MWC 2019, but it clearly feels that there's enough room between them to fit another model. The Galaxy A40's first press renders just leaked, revealing key specs like the camera, the fingerprint scanner position and the ports. 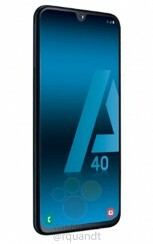 The Samsung Galaxy A40 will be offered in Black, Light Blue, and Coral. It will have two cameras on the back, one of them looking like an ultra-wide shooter. 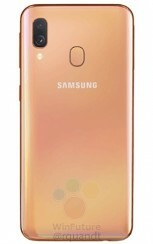 The fingerprint sensor will be on the back panel instead of under the display like the Galaxy A50. 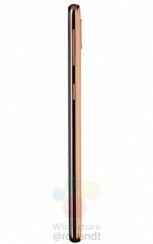 There is one front-facing cam in the U-shaped notch, while the bottom features a 3.5 mm audio jack, USB-C, and a speaker grille. 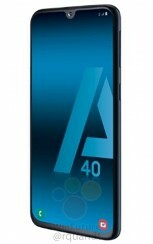 Rumors are the screen will be 5.7” in diagonal, which is smaller than any of the already launched Galaxy A phones. The phone appeared on Geekbench with an Exynos 7885 chipset and 4 GB RAM and is said to cost €249. 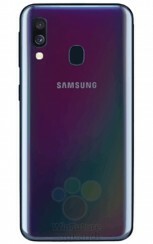 The phone already appeared on the Samsung UK website, and will likely be one of the three to launch at the April 10 event. Let's hope it's not another Samsung battery won't last a day Phone. 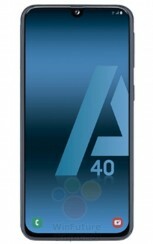 Irrespective of sizes we need 4000mah as standard.